Every year, thousands of pedestrians are killed as the result of traffic crashes that could have been prevented. Over 70,000 pedestrians become injured as a result of traffic crashes every year. Pedestrian safety is a topic that can be easily overlooked, however, society needs to remain conscious of the increasing danger posed by distracting smartphones, mp3 players and more. If you are a pedestrian who was injured in a traffic crash, then you may be entitled to recover damages for the injuries that you have suffered. A personal injury lawyer in Illinois can meet with you to calculate the total damages that may be available in your case. It is also important to understand the statistics behind pedestrian accidents in the U.S. and Illinois to know that you are not alone if you have been involved in one of these accidents. Unfortunately, pedestrian accidents are becoming more common every year. People age 65 and older were involved in 19 percent of all deadly pedestrian accidents. Following these tips may decrease the likelihood that one is injured or dies as a result of involvement in a pedestrian accident. These simple tips can be life-saving measures that help pedestrians and ultimately reduce the tragic death rate of pedestrians in the U.S.
Chicago has continued to experience a decrease in its trend of pedestrian traffic accidents. Individuals between the ages of 15 and 18 are the ones who are most commonly involved in pedestrian accidents in the city. The majority of pedestrian accidents tend to occur in urban areas in Illinois. The Illinois Department of Transportation also reported that 4,419 of its total pedestrian crashes took place in urban areas. Only 246 of the pedestrian accidents occurred in rural areas. The majority of pedestrians involved in accidents tend to be children or high school age children. Children ages 15 to 18 had the highest rate for pedestrian crash rates in Chicago in 2011, while children ages 5 to 14 had the second-highest rate for pedestrian crash rates in the city. Pedestrian accidents are also most likely to occur on Thursdays in Chicago. The day with the fewest pedestrian accidents in Chicago was Saturday. One may be concerned about avoiding pedestrian accidents by avoiding areas in which accidents may tend to occur. The 2011 research study also indicates that pedestrians had a high likelihood of being injured on the following streets within the Central Business District: Michigan/Chicago to Oak, Dearborn/Ohio to Huron, Columbus/Fairbanks/Water to Ontario, Jackson/Clark to Wabash, Canal/Jackson to Washington. If a driver or pedestrian anticipates in being within one of these areas, then he or she should utilize the utmost care while walking or driving in the area. It is important to take every precaution possible to avoid being involved in a pedestrian accident in these areas. 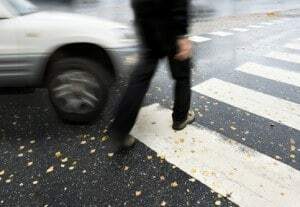 There can be many types of causes that account for pedestrian crash rates in Illinois and the U.S. Understanding what can cause pedestrian crash rates may help a person to avoid being the victim in one of these serious crashes. Some pedestrian accidents result from technology distractions used by a driver or pedestrian at the time preceding the accident. A pedestrian may be listening to music on an iPod or text messaging on a smartphone when he or she is suddenly sideswiped by a car. A driver may also be using a smartphone or listening to loud music when he or she hits a pedestrian. It is also not uncommon for drivers to get into accidents while changing music on an iPod or other mp3 device. Driving distracted accounts for the majority of these pedestrian accidents. In addition, there are other factors that can also make it more likely that a driver may be at risk for hitting a pedestrian on the road. Poor construction of sidewalks or roads may make it easier for cars to hit pedestrians. Sidewalks that are in disrepair may discourage pedestrians from using them. In addition, an increasing elderly population may also account for the significant number of pedestrians injured in accidents every year. As the baby boomers continue to drive and make up a large part of the U.S. population, it is possible that these elderly drivers may simply not be aware of others on the road due to poor vision, poor hearing or inability to react quickly. Lastly, a lack of educational programs for cyclists and pedestrians may also account for the shocking statistics as to the pedestrian deaths caused in Illinois every year. A greater effort must be made to teach pedestrians about safe ways to use sidewalks or navigate through busy intersections. Pedestrians should be aware of the meaning of all traffic signals so they are not harmed. If you are involved in a pedestrian accident, it is important to get help as soon as you possibly can. An experienced Illinois pedestrian accident attorney can make sure that you are not left without legal recourse after an accident. Whether you need help in locating the party accountable for your injuries or want to know the total value of your claim, a personal injury lawyer can help you. Get in touch with Illinois personal injury lawyers to move forward in your case and stand up for the rights of pedestrians on the road everywhere. You may be able to recover compensation for your medical expenses, pain and suffering, lost wages and more. Contact us today!